Join this 1 Day Pilgrimage of Origin to drink in the Medicine of the Motherland. We will travel by private mini bus in the morning, leaving the city behind and heading over the mountain to the walker bay nature reserve. The Klipgat cave is inside this pristine nature reserve. Remains dating between 65 000 yr – 85 000 yrs were found inside this large cave and was found to be home to our first peoples. Evidence of herding fat tailed sheep were also found. The Drup Kelders – ‘Drip Cellar’, is what the De Kelders area is named for. This ancient underground fresh water cave is a marvel to behold. Now privately owned and locked by the owners, access is given only via tour operators who charge a per person fee for entrance to this magical site. It is well worth the effort to enter this stalactite filled space, the ceiling is covered with stalactites that are still growing and the fresh water pools invite you to anoint yourself in this sacred body of water. We are blessed to be joined by Bradley Yellow Man who speaks the original Nama language of the First peoples. In sacred circle our ears will hear and our hearts will feel the click language again. Together we are invited to open our hearts, ears and mind, to tune in and listen for ways that we can enrich our experience of self, our relationship to one another and to mother earth. We will spend time in the Klipgat Cave together in sacred ceremony, our holy words will mingle with the air and the land, we will have time to a walk on the wide expansive beach, to visit the Drup kelders cave for a water blessing and enjoy a picnic before heading back to the city. Our group is limited to 12 people for this journey. Each pilgrim are asked to bring a picnic lunch to share. Total cost of R1350.00 includes Full Transport with Driver in Private Taxi from the City to De Kelders and back, your Entrance fee at Walker Bay Nature Reserve, Entrance to the Drup Kelders Cave and Facilitation fee’s for Rah-Nomvula and Bradley Yellow man. Please contact rah@divinelotus.co.za to secure your space in this sacred day blessing. Please wear sturdy comfortable shoes, and warm clothes as Cape Town weather is unpredictable. Bring a hat for sun protection, sun screen, a swimming costume and towel for a dip in the ocean. We will share our food with one another in circle, please bring your shared lunch and any water, juice or tea. I look forward to this sacred opportunity. Our beautiful Motherland holds some of the deepest threads of divine feminine consciousness on mother earth. Come home she says,’ I am the medicine you seek’. 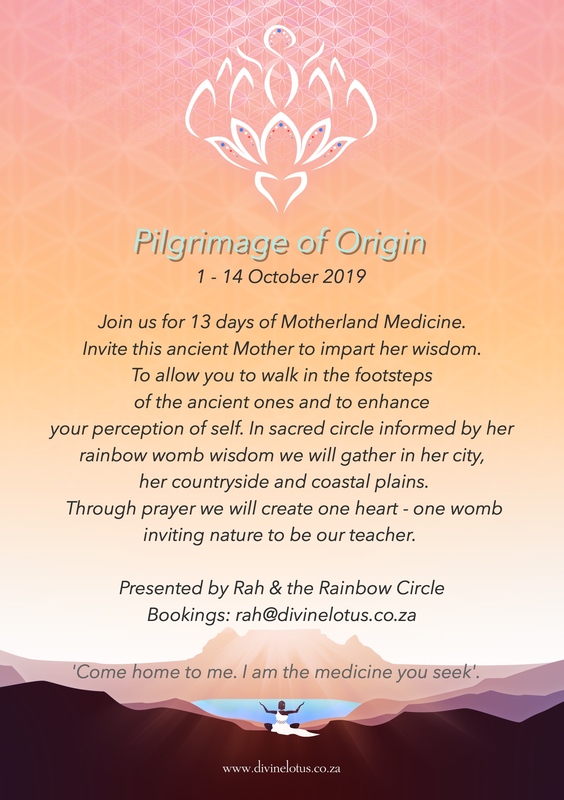 Come, join us for 13 days of Motherland Medicine, Invite our ancient Mother to impart Her wisdom. To allow you to walk in the footsteps of the ancient ones and to enhance your perception of self. In sacred circle, informed by her rainbow womb wisdom, we will gather in her city, her countryside and her coastal plains. Through prayer we will create one heart – one womb inviting nature to be our teacher. Arrive and stay for 3 days at a historic family owned District Six establishment, an opportunity for us to support a local South African family. Light Earth Activation ceremony on top of Table Mountain, one of the Wonders of the World first named by our First Peoples as ‘the mountain that rose from the sea’, long before this was proven scientifically. Experience a local South African Township Tour. Enjoy a spectacular drive along our most scenic historic Chapman’s peak drive. This scenic road took 7 years to complete in the 1900’s. Be nourished by delicious vegetarian cuisine for breakfast, lunch and dinner in the beautiful countryside Retreat of Bodhi Khaya in Stanford. Here we will have time to walk in the forest and swim in the dams. It is gift for us to join this beautiful community. We pilgrimage to one of our most sacred sites, the Klipgat Cave in De Kelders, where we will enter into ceremony in circle with representatives of the First peoples of our Motherland and bless our ears and heart with the sound of the Nama language. The Drup Kelders is the name after which De Kelders is named. A sweet water underground spring that once fed the First peoples who lived along this pristine coast, still fill the pools in which you are able to immerse yourself and receive a water blessing. We visit and listen to the Lions at Panthera Lion Sanctuary. Overnight at a 5 star Game Reserve with 2 Game drive options included to experience the Big 5. Stay in historic Inn at Simon’s town, where our rainbow nation lived in harmony with one another before the apartheid era. Experience a Sacred African Puppet Ritual and Blessing with Water Priestess Aja Marneweck. Morning free to enjoy Simons town harbour and shop for gifts. 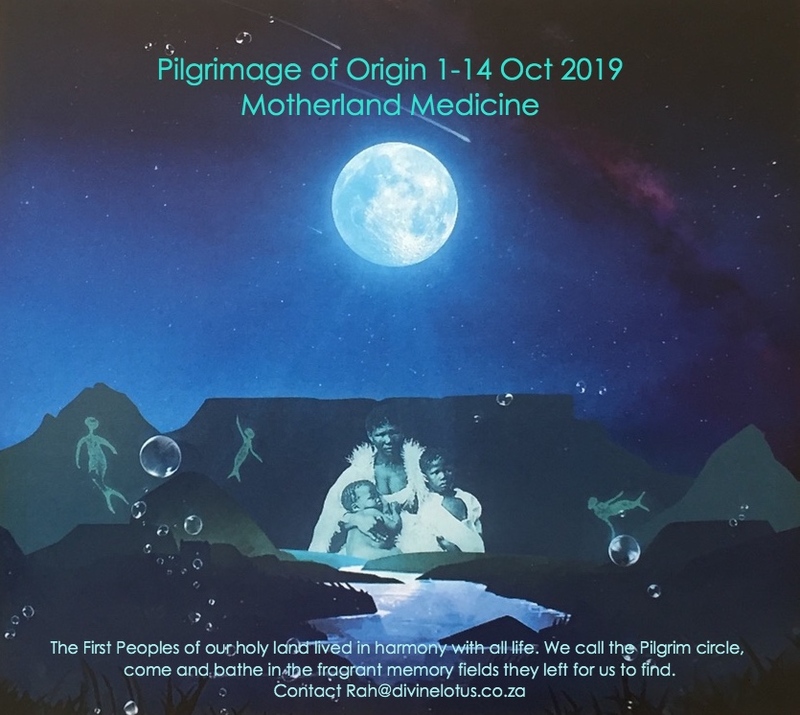 Rah-Nomvula will facilitate this sacred pilgrimage, supported by representatives of the First Peoples, the Community at Bodhi Khaya, and Priestess Sister Aja Marneweck. Your are responsible for your own travel air costs to and from Cape Town, South Africa. Your pilgrimage costs include all the above, 3 airport pick ups is included on 30 September. If you arrive on another date, your airport is for your own cost. And I can organise that for you. Breakfast is included every day. Only 6 days of full board is included. We will enjoy a few picnic lunches. 2 Traditional local dinners will be cooked for us, Entrances to national parks are included, All major transport costs are included. Excluding the short travel experiences close to our hotels which is very reasonable. Total cost excluding airfares is $2350.00. Your 50% deposit paid by 1 June 2019 secures your space. Full balance due on 30 August 2019.